Deep in the Red Valley (Valle Rojo) rests a set of colored mountains, overlooked by the famous Ausangate Mountain. Those mountains are Palcoyo, accessible by a 3 and a half-hour drive from Cusco and a 2-hour hike. 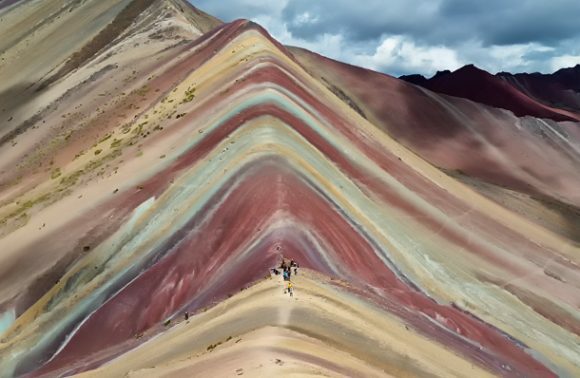 The Rainbow Mountains of the Andes have become incredibly popular among tourists, due to the Vinicunca Mountains opening as an attraction in 2015. Hundreds of tourists travel to the valley every day, often braving rain and mud, and heights of over 5,200 meters. As Vinicunca has become so incredibly popular, there is a tendency for it to become overcrowded. You can expect to walk with a crowd all the way up to the top, and the chance that you will be able to get a picture of just you and the mountain is almost nonexistent. There’s no doubt that Valle Rojo is beautiful, and you will see some of that beauty on the path to Vinicunca, the red hills surrounding the valley and the majestically white peak of Ausangate on the east side. You also might find yourself a little light-headed, or even completely out of breath. You will be climbing over 700 meters during the two-hour hike, and the majority of it is done at the end. This can be really tricky, especially if you haven’t given yourself enough time in Cusco to acclimatize. 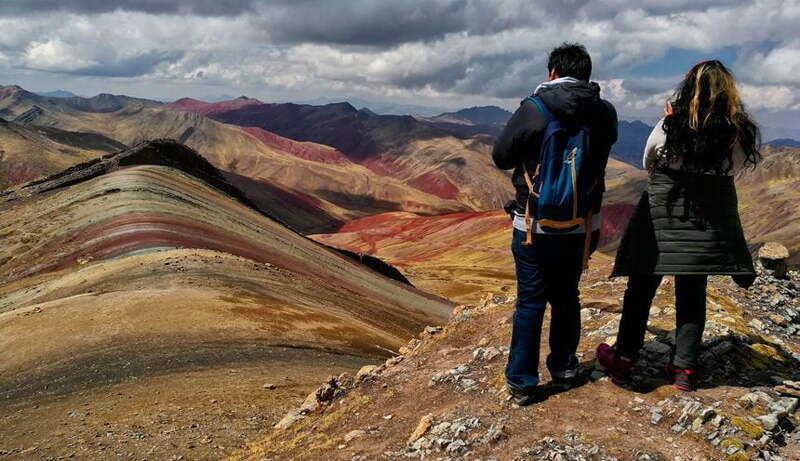 Palcoyo, a rainbow mountain experience of its own. As you will be right in the middle of the Red Valley, the entire hike will be part of the experience. Challenging enough to be an adventure, but not so tough that you risk passing out. It happens! 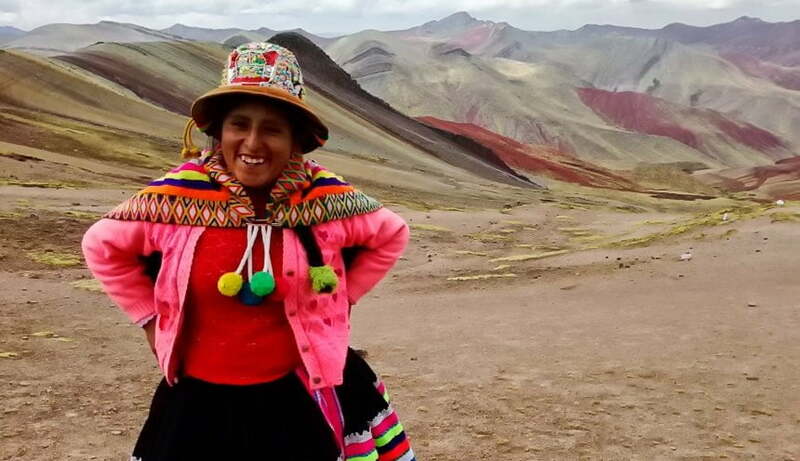 It has been just 3 years since Vinicunca was targeted as a tourist spot. Since then, droves of tour buses can be seen, making their way directly to the little market that has sprouted just before the hike begins. 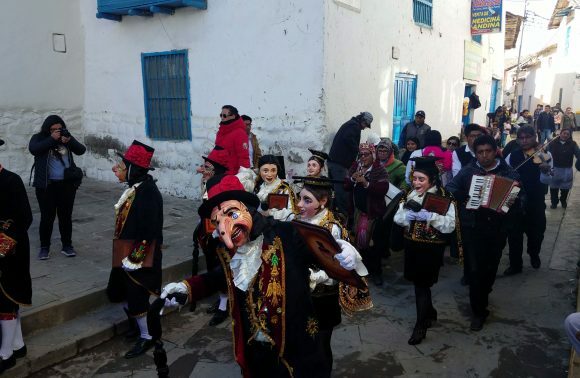 Palcoyo is a chance to drop yourself directly into the heart of the Andes. 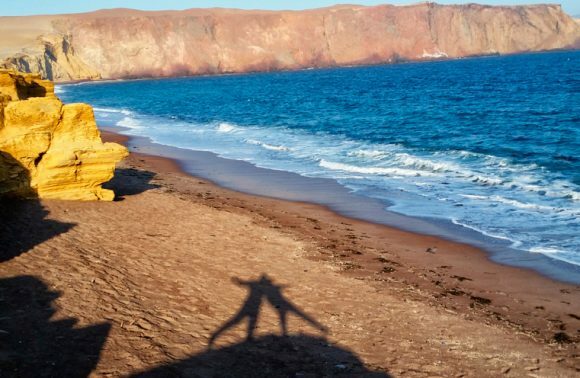 As Vinicunca takes up most of the rainbow-hued spotlight, fewer tourists know of any alternatives. 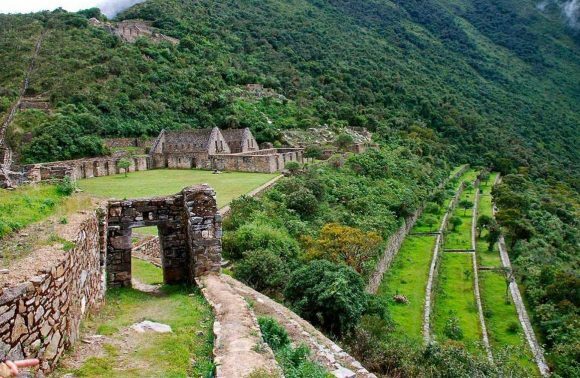 Therefore, you have the chance to discover a world of winding trails, roaming alpacas, and Andean families living their daily lives. 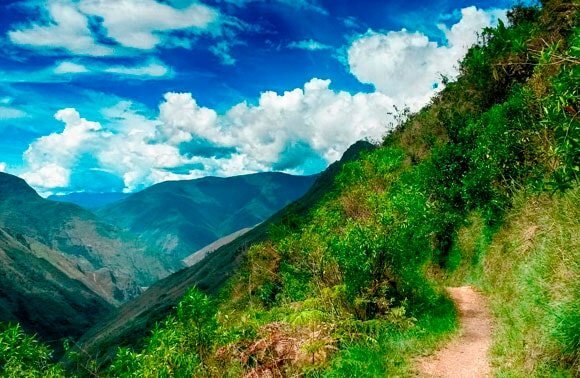 If you’re looking to experience the mountain ranges of Cusco and witness the Red Valley without having to wait in line for a photo, Palcoyo should be on your list. Tourists to Vinicunca can tell you that one of the most unpleasant things about their experience is usually the time it takes to travel to the site. It literally takes a full day, with tours departing at a 3 AM and returning between 6-7 PM. There is therefore little time to do other things, and visitors are usually too tired to do anything but sleep afterwards. Palcoyo, on the other hand, is a refreshing experience in itself. It starts at 6 AM (early, but not early enough to make you feel tired). The travel time and hike are shorter; only 3 and a half hours to drive there, and 1 hour 45 minutes of hiking. And above all, you still have plenty of time to enjoy the scenery. Another perk of Palcoyo is its relative closeness to one of Cusco’s UNESCO World Heritage Sights, the amazing Q’eswachaka, the last remaining Inca rope bridge. 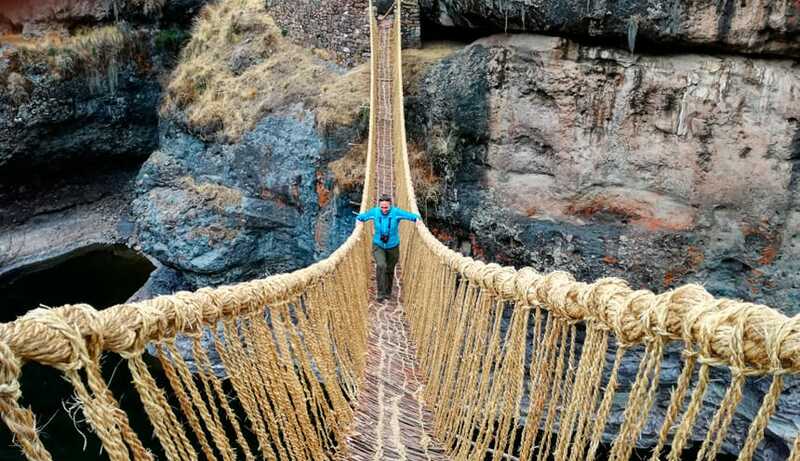 The pride and tradition of the local Quechua culture are kept alive by this bridge, hand-woven entirely out of braided grass. The entire community works together to rebuild it yearly. During this time (around mid-June) a festival is held. Workers, surrounded by their traditionally dressed neighbors, traverse the old bridge carrying the supporting grass ropes of the new one. Seeing this bridge is an impressive sight to behold, and is reached only 1 & 1/2 hours after your adventure in Palcoyo. 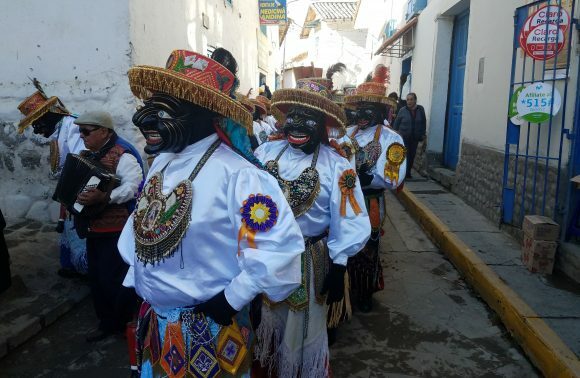 This makes the day a busy one, but steeped in authentic experiences: quiet paths along the red hills, local communities encountered along the way, and a little bit of Quechua culture.